The Rolex Daytona is an iconic success story that began as a tool of ambition. First introduced with the “Daytona” signature in 1965, the watch proclaimed Rolex’s sponsorship of the celebrated sports car race in Daytona Beach, Florida. For the Daytona specifically, Rolex had introduced a couple of major stylistic changes from its earlier chronographs, drastically improving the utility of the watch with a race car driver’s needs in mind. First, the inverse colors of the main dial and registers provided the watch with a sportier look and clear contrast to read elapsed times in each sub-dial. Second, the tachymeter scale was removed from the dial and engraved onto the bezel, allowing for greater legibility. The historic Daytona race was born at the turn of the 20th century, at Daytona Beach (shown above). 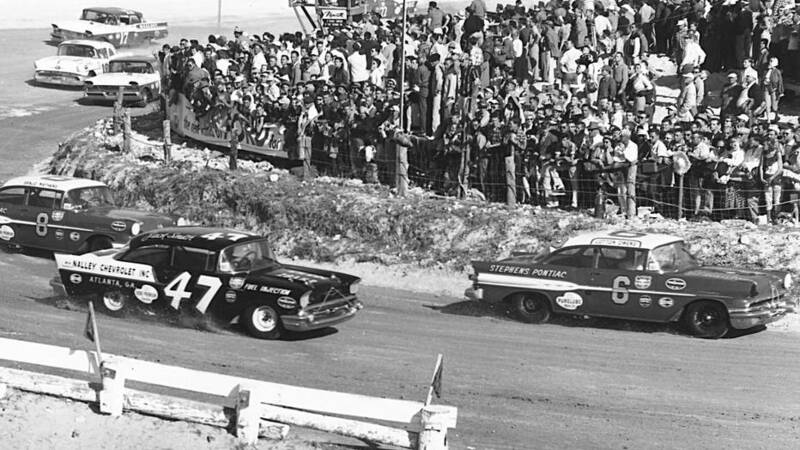 Only in 1959, did the race relocate to the world-famous Daytona International Speedway. Yet despite its durability, aesthetics, and reliable movement, the Daytona was not hugely in demand when produced. In fact, many sat at retailers before they were sold, and often at steep discounts. At the time, Rolex was competing with a host of other watch brands that had already been well-known for creating chronographs. Furthermore, the Daytona remained a manually-wound timepiece until 1987, during the height of the world-wide craze for quartz movements. Like all success stories, the tides would turn for the Daytona. The cult surrounding its “exotic dials,” popularized by Paul Newman, coupled with the strong return of wristwatch collecting in the late 1980s would elevate the Daytona to become one of the most famous and coveted watches of all time. 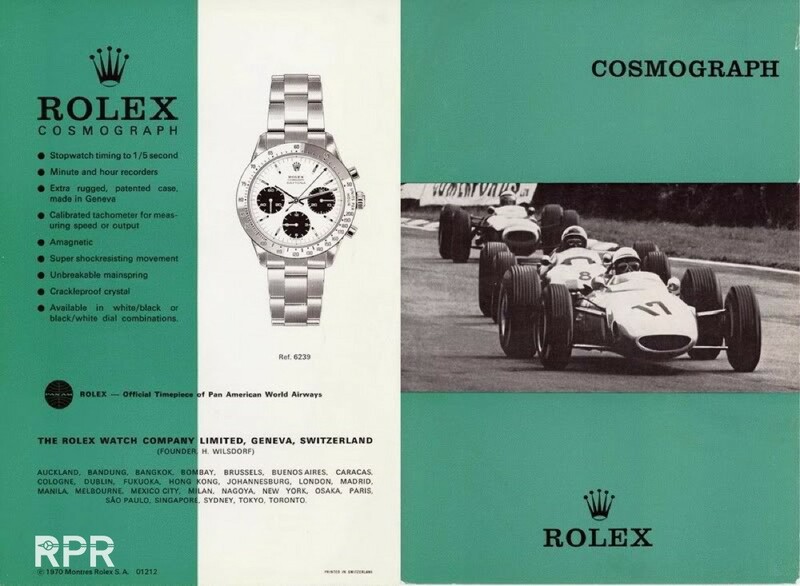 A 1970 advertising spread for the Rolex Cosmograph Daytona Ref. 6239. And in typical Rolex fashion, the Swiss brand would continue to innovate and improve on the Daytona, all while maintaining their strict codes of time-keeping accuracy. Rolex’s first iteration of self-winding Daytona’s incorporated the Zenith “El Primero” movement. It was the only automatic chronograph movement that Rolex deemed acceptable by their standards, and even so it was still heavily modified. In 2000, Rolex presented the culmination of years of development, the Daytona Ref. 116520—featuring the in-house caliber 4130. Rolex introduced significant changes—such as a chronograph function that could run continuously without negative effects, improved shock resistance of the balance wheel, and more—all while eliminating redundancy in parts, making it a much more serviceable watch. To many collectors, the combination of the enhanced water resistance of the Oyster Perpetual case and the near-flawless caliber 4130 makes the Ref. 116520 the ultimate Daytona. With over 50 years of history, starting off as highly utilitarian piece of equipment, the Rolex Daytona remains to this day the perfect watch for any occasion. In all its omission of decorative features typical of other high-end watches, the watch is nigh-indestructible and meant to be worn every single day of a man’s life. We are pleased to offer a fine selection of vintage and contemporary Rolex Daytonas in our September 2018 Important Watches auction—featuring subtle, yet impactful variations throughout Rolex history. Rolex "Paul Newman" Daytona Ref. 6239 in Steel. Achieved $275,000 at auction. Rolex "Four-Line" "Zenith" Daytona Ref. 16520 in Steel. Achieved $43,750 at auction. Rolex "Zenith" Daytona Ref. 16518 in 18K Gold. Achieved $17,500 at auction. Rolex "Patrizzi Dial" "Zenith" Daytona Ref. 16520 in Steel. Achieved $31,250 at auction. Rolex Daytona Ref. 116519 in 18K White Gold. Achieved $16,875 at auction. Rolex Daytona Ref. 116520 in Steel. Achieved $15,000 at auction.